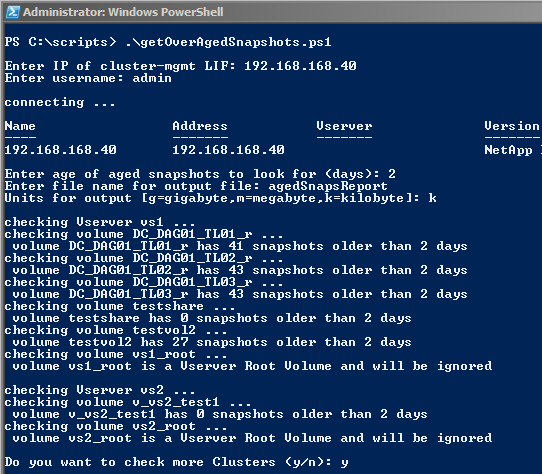 The following script was created to find over-aged snapshots in a multi-cluster Clustered ONTAP environment. The script runs interactively, asks for connection IP and credentials, asks what age we’re looking for as over-aged, and then runs through the cluster checking for over-aged snapshots. When finished checking one cluster, it prompts whether you want to check another. The culmination of the script is an excel spreadsheet report with each cluster on a different tab, and listing all the aged snapshots. Copy the below and save as getOverAgedSnapshots.ps1 (or whatever name you like) and run! PS Apologies for the formatting of this script on this blog … and at the end is an image of the script in action and example of the output. $controller = Read-host "Enter IP of cluster-mgmt LIF"
$user = Read-host "Enter username"
$daysWorth = Read-host "Enter age of aged snapshots to look for (days)"
$units = Read-host "Units for output [g=gigabyte,m=megabyte,k=kilobyte]"
$conversion = 1; $unit = "B"
echo "checking Vserver $vserverName ..."
echo "checking volume $volumeName ..."
echo " volume $volumeName has $snapCount snapshots older than $daysWorth days"
$cells.item($row,1)=$volumeName+" has "+$snapcount+" snapshots older than "+$daysWorth+" days." $confirm_do_loop1 = Read-host "Do you want to check more Clusters (y/n)"
# the above deletes any pre-existing file with the same name! 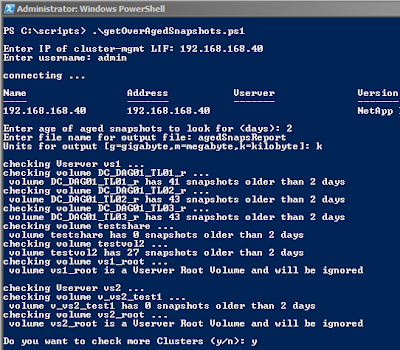 Image 1: The Over-Aged Snapshot Check script in action!